This week is all about the Christmas Party. A lot of people begin thinking about this stuff early on, and no doubt you’ll be invited to a ton of these as November and December progress, but if you’re thinking about hosting your own, I have some tips for you. I’ve got some game, decor and food suggestions, so all you’ll need in addition to this is your favorite holiday playlist. If you don’t have one, check out Spotify or your other favorite music streaming service for playlists. What Christmas Party is complete without some crazy game? It’s a great way to encourage chatter among your guests in a fun and friendly way. You can find scads of printables on the internet for these games. My Party Games has a super awesome repository of various games that you can print off for your party. You’ve heard of beer pong? This is the less alcoholic version. Check out the full tutorial available from Playground Parkbench. I’ve also seen a nose for rRudolphor snowmen noses. Pretty simple, find a suitable grinch picture on the internet, print on some green cardstock and print off some red cardstock hearts. Twin Dragonfly Designs has all the details for you to check out! My favorite style of this is a thieving Santa exchange. You pick a gift theme (I like picking a letter and all the gifts have to start with that) and then draw numbers. First person picks a gift, opens it, the second person can either steal or pick and so on. I also recommend selecting a price range, usually between $10-$20 is perfectly fine. Last week I introduced some of my favorite decor ideas for Christmas. However, if you’re looking for a little bit of extra punch for a party, let’s explore some options. Thank Living Locurto for this one. Get some light up balloons (available at Walmart or perhaps your local dollar store), some green plastic party cups (or you can paint white ones) and some green ribbon. These beauties can dress up your buffet table, particularly luminary accents. My favorite design is amazingly simple, grab a glass vase, toss some Christmas balls in with some twinkle lights and light it up. Halfbaked Harvest has a fantastic idea to make your house smell like Christmas. Heck who needs a party as an excuse for this? 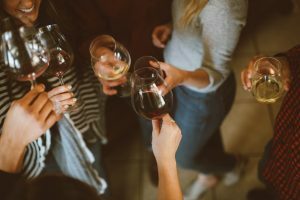 It will largely depend upon whether you are hosting a party that includes a full sit down meal or whether you just want more of a buffet style. I’ll have a post near the end of the month regarding a more formal seating for dinner, so this section is all about food that is more portable. You can find dozens of different receipes, my favorite is from How Sweet Eats, their Pomegranate White Cheddar ball. I honestly think I won’t even wait for a party excuse to make it! This delicious looking Christmas tree comes from Eclectic Recipes, the fresh chopped rosemary and basil add a lovely green hue to the bread as well! Peas and Crayons has an amazing recipe, I particularly like the addition of crab meat for some extra yumminess. Arrange your veggie tray in the form of a wreath (or heck, you can probably do a christmas tree or even a snow man with the right picks!). Provide your favorite dip and done. The best way to prepare nachos is in the oven. Spray a baking pan to prevent all the nacho goodness from sticking. I also like to brown the ground beef (or ground chicken or pork) before hand as well. Toss the nachos and your fixings onto the baking sheet and bake until the cheese has melted (about 5-6 minutes on 400F). So Prepare and then Be Merry! 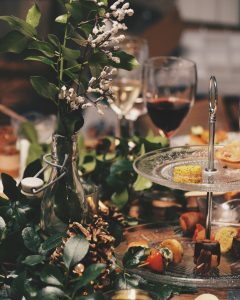 It can be daunting throwing a Christmas Party, but with some prep time ahead of the date, you can pull it off with ease. Also, don’t underestimate the value of heading to your local deli for a prepared cheese tray or other appetizer, it can save so much time and they are usually quite delicious. So that’s all for this week, next week will be tips to keep your sanity during the busy holiday months. If you liked this post, please pin it to Pinterest or share on your favorite social network. Also, if you have a favorite party game, party dish or decoration that you’d like to share, let me know in the comments down below! Until next week, happy crafting! Christmas is really around the corner. 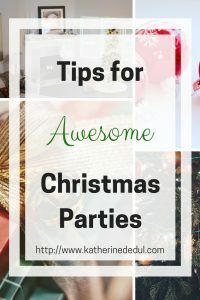 Reading your tips for an awesome Christmas party made me felt the the different kind of vibe during this season. Thanks for sharing.